Kodiak makes a one-of-a-kind tent to last a lifetime. 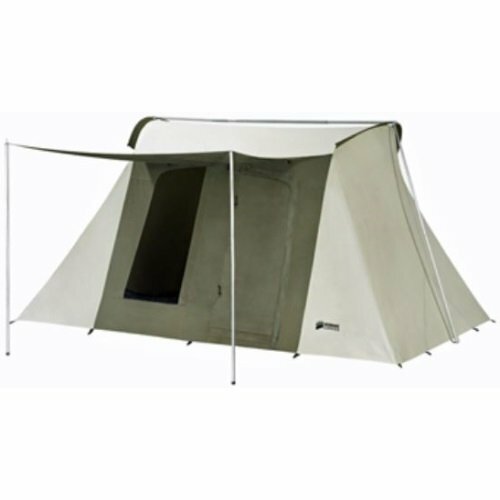 This tent is a basic tent, but includes all the necessary items to make your camping experience clean, warm, and dry. No need to worry about the micro-burst storm you didn’t anticipate. These tents are built to withstand harsh weather. It keeps you dry in rain and cool in the hot summers. Canvas breathes and the windows allow airflow to keep temperatures to a minimum. The heavy duty zippers are like those you find on your luggage bags. They don’t get caught and jammed and last a lifetime. 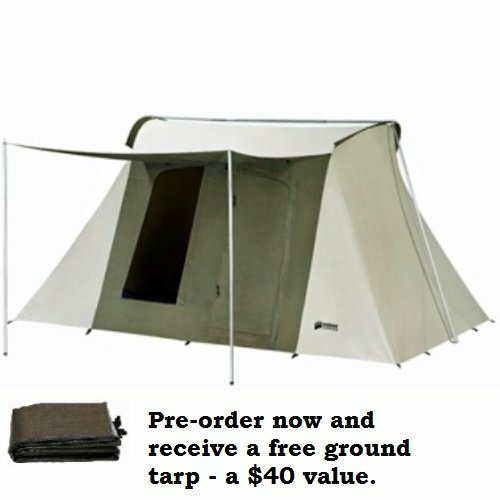 Be the envy of the camping spot or camping group by showing up with a canvas army-style tent. These are popular for hunting, desert events, mountain camping, family reunions, and more. By a good tent one time when you purchase a Kodiak tent. Read the reviews and talk to our customer service experts with any questions. 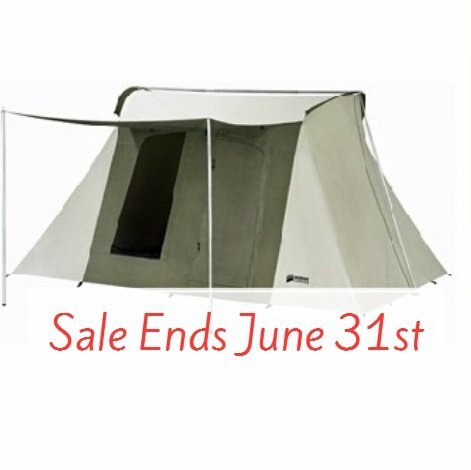 Competitive Edge is the only place to shop for a tent. Had mine at the door in 5 days for free! Had a couple of questions and the staff was really helpful on the phone. Now to the good part. What a great tent. Set it up by myself in the backyard for the initial wetting down. Went up pretty easy. I cant believe the amount of room inside this thing and how much usable space it holds. I cant wait to get it out in the woods. I could not be happier with this tent. I looked extensively at both Kodiak and Springbar tents. I believe the Kodiak is better in all respects. Better quality, more features, and lower price. This tent is easy to set up and take down. Very sturdy, held up great in a few nasty storms. Also Competitive Edge has the best price around. Haven't set this tent up yet, but did receive it sooner than expected ship date. Price is far less than I have found for any similar tent. Looking at it out of the bag, the materials look good, floor looks tougher than I would have expected. Unlike most canvas tents, this one comes with the frame and stakes. cant wait to get this to the mountains and set up camp. I am putting a wood stove in mine, and will send pictures when it happens. Good Quality tent. Delivery was fast from Competitive Edge. Did not realize the front tent door did not have a screen covering under door flap. Guess I should have looked more carefully at description before I ordered. I probably would have upgraded my order. I have not used the tent yet on a camping trip but I did take it out and set it up. From what I can see it is a great tent and very well made. One person can set it up without much trouble but as with most tents it is easier with two people. I found this tent on sale here for $150 less than my local retail store. Buy this tent and you wont be sorry! We are very pleased with the tent. We haven't had the opportunity to use it to date, but are impressed with the sturdiness of the canvas. We will be using it in a couple of weeks and will know more then. Shipping was good (as requested). The ground tarp was left off of the order and was sent immediately with no problem. Excellent customer service. I was impressed with the quality of workmanship and the attention to design. The materials are superior from the canvas to the zippers, floor, poles and stakes. And the customer service was excellent. I ordered it on a Fri. morning and it arrived on Tues. afternoon. I'm very happy with my purchase. Sean at Competitive Edge Products was great to work with. There was a week that passed between my initial inquiry and purchase and he had all the notes from the original conversation. His follow up with invoice after the sale was also first rate. The tent arrived quickly and was well packaged. I set it up, amazingly simple as advertised, and seasoned it. I also hit it with a couple cans of Kiwi Camp Dry just to be safe. First and only trip was to Burton Island in VT for a week of fishing. Weather was great except for one huge t-storm the day before we left. 40-50 MPH wind gusts and torrential rain. Tent faired well, but I did roll up the awning as a preventative measure. Did have several spots of water come through and some puddling as a result on the floor. I have since set the tent up and retreated with 4 cans of Kiwi in hopes that the spots letting water in will wick it. I did notice one spot on the floor where the vinyl was missing, but the webbing was still there. I have contacted Kodiak to see if they have a patch kit or some sort of liquid vinyl that I could use to fix this small blemish. Its only 1/4 in size, but I want to correct it now. Extremely comfortable, easy to set up, I was worried there wouldn't be enough air circulation with only two windows, but for the week of 80-100 degree temps it was great. I'm excited to use this a lot this Fall and next summer. I recently ordered this product only to find out through e-mail that it was sold out. Needless to say, I was extremely disappointed. My sulking did not last for long because Competitive Edge offered to upgrade my order to the Deluxe model free of charge. I cant say enough good things about Competitive Edges products and costumer service. The Kodiak tent is awesome, we used it in the backyard. I was very excited about the Basic model and I'm sure I would've been more than happy with it but the Deluxe model is amazing. A big thanks to Competitive Edge for being so awesome. We haven't used the tent yet. We are taking it to Burning Man because we were told its one of the best tents to keep the dust out. When we got the tent, the storage bag was missing. I notified Competitive Edge, they replied quickly and I am awaiting the storage bag. Will update later as to how things worked out. Got this tent in two days! Needed a tent for a cook tent at hunting camp. Was impressed with the quality of the zippers, ease of putting it up and down. The ground tarp was perfect. Cant beat the price and the free shipping! Had a short but intense rain shower, no leaks. Had moisture in tent after cooking dinner, coffee etc.,it was gone in 10 min. with the temp. outside at 80+ degrees. Great tent! Great tent ! We bought this tent about a month ago . We have taken it out two times already . Very easy to put up ,very well made . We go camping as much as we can through the year . I have owned several cheaper tents they do not hold up ! If you love to camp as much as we do, buy this tent . You will not regret it at all . 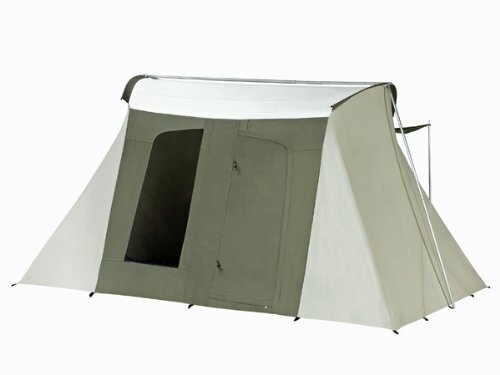 My second Kodiak and I would recommend these tents to anyone considering buying. They are solid and the canvas is as good as Springbar. The floor in my opinion is better than Springbar. It it strong and waterproof. Very fast shipping as well. Great tent. Easy to "pitch". Was a bit worried about stability with just two poles, but with all ground stakes placed, the tent went nowhere in the wind. Would likely need a ground not too soft for the stakes, and not so hard they cannot go into. A lot of room in the tent will make this our second home. Well made product. Better floor and poles than the Springbar at a lower price. This tent is very well put together, But would like to see the doors of the tent done in white canvas and the sides done in the dark canvas. The awning needs a little work it appears that the water could run down towards the entrance, Maybe an additional pole in the center of the Awning. With our heater we stay warm and dry during recent hunting trip. Wow! Delivery was amazingly fast. I was unable to have time to set it up before my trip hunting, so when I got to the woods I was excited to see just how easy it was to set up. during a storm I sleep very soundly. The wind and rain did not effect this tent in any way. Only one thing went wrong with it as now it has a neat Camouflage effect because the leaves sort of stained the roof area. no damage done. The awning needs to be set for drainage otherwise it pools in the center. No biggie. One night was about 34 degrees and my buddy heater made the interior nice and toasty on low setting. I sat inside and ate my supper at a table I set up and listened to the radio while the storm raged on. This tent is like having a motel room in the woods. Not a back packer tent due to weight but definitely worth the money. Setup was a snap. Great workmanship cant wait to use it again. Happy with Tent. Great price, Great service. Ordered over the 4th of July and did not expect to receive it so soon. Thank you! 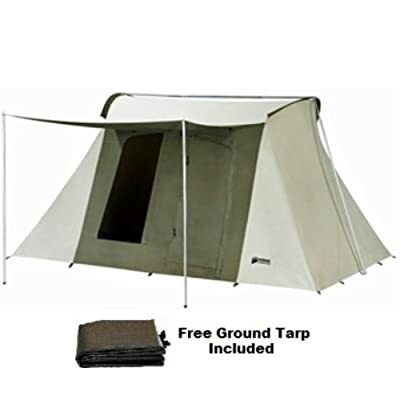 we finally used this on an overnighter, it was so quick and easy to set up and very roomy inside without the nasty canvas smell of a sheep herders tent. This tent was built to last!!! The only thing it is lacking is a privacy curtain so that when you want privacy to change your clothes etc. I would recommend this to everyone. We bought this tent for our scouts because for some reason they all like to cram into one tent. This one is big enough that they can even fit some of their gear.